Blue flamingos (Aenean phoenicopteri) have been found in the Isla Pinzon archipelago, (in the Galapagos Islands) on January 23rd, 2012. As it has a long beak and long, thin legs, the people who spotted the species recognized the animal almost immediately. Unlike the American flamingo, blue flamingos have bright blue feathers, yellow eyes and short bodies.The bird has been named "South American Blue Flamingo". “It was like seeing any normal flamingo, but blue and smaller than an average American flamingo,” reports undiscovered fauna specialist Jennifer Webber. "Compared to the large amount of flamingos you'd see on a beach somewhere, there was only a small flock of birds gathered together. Only thirteen South American Blue Flamingos are known to be existent across the world!" The birds have been captured and are now being shown off at an exclusive zoo near Dukesway, Chicago, U.S.A. and are visible only to special scientists from around the world. On August 19th, 2012, the flamingos will be set freely back to where they were found. The South American Blue Flamingo measures 49" (from head to heel). 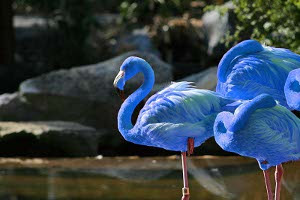 Due to fossils and bones found around the island, cientists believe that in 1984, over a hundred blue flamingos existed. We think that the Tip-tailed Cougar, who is red-green colour-blind, has preyed upon the blue flamingos since he cannot see the pink flamingos, causing many blue flamingos to lose their lives. The South American Blue Flamingos had no choice but to run, but the cougars had incredible speed and had no difficulty catching up to them. The male birds will show off using their handsome feathers and their calls, to attract the females. Baby flamingos will hatch with a very pale blue down that will turn into bright feathers as they get older. The South American Blue Flamingo does not get along well with the American flamingos, as they screech and peck violently at each other. "We were so surprised when we had to separate the birds. Why they didn't cooperate is still a mystery to us," continues Jennifer. "We wonder why, since both birds are flamingos." The blue flamingo eats a diet of the bluefish and shrimp that live around the island, which is supposedly the cause of the flamingo's blue feathers. As well as being shy, the birds are extremely friendly and playful once you have gotten to know them. if you approach a blue flamingo and he/she is unfamiliar with you, it is very likely that the bird will try to peck at you. Never hold out your hand as you might for a puppy. This bird has a big beak and it IS painful if you are bitten. The South American Blue Flamingos do not have very good eyesight, which is a problem when it comes to the bird's predators. They take advantage of the situation and try to attack the blue flamingo whenever they get a chance. Lastly, you must never approach a South American Blue Flamingo when the bird is sleeping. It is most likely that he/she will wake up and attack you. Many blue flamingos also have extremely sensitive ears, and they can hear you if you are near them. We believe that they assume that you are trying to harm them in their sleep. Imcredible, I didn't know they exist, it is such a wonderful magic creature, thank you for the information! Phoenicopterus chilensis and Phoenicopterus andinus... two South American flamingo species, are both pink. The flamingo found in the Galapagos is called Phoenicopterus ruber and "Nicknamed the Rosy Flamingo, most of their plumage is bright pink in contrast to the paler European or African species." I'm sorry, but I don't believe you; the latin name doesn't make sense. The species name is an alteration of the genus name for flamingos which you would only get if these birds were in a different family. Bluefish are coloured through refraction of light whereas pink flamingos get their colour from pigment in blue-green algae. Also, the photo is too similar to real flamingos and there are only six species of flamingo. Nice try though and if I'm wrong; I'm truly sorry. If I'm right, it's hilarious that other websites have pinched your 'information' and actually believe it's true. Hello. If only you'd tried harder, anonymous author, this had the potential to be realistic. You chose a relatively obscure tropical island, employed semi-coherent details on their measurements, biological properties, diet, and ecological mode, and you even mentioned fossils. But besides the wonky science that Thomas has noted, this fictional article is just about too obviously a joke. To be honest, it feels like the kind of work I would have written in middle school or early high school, which isn't necessarily a bad thing, but the story is soaked through with an unfortunate vibe of not taking itself seriously. You should have either gone more jokey or far, far less jokey. Anyways, it is indeed quite funny that this story has been picked up by content aggregates which mistook it for fact. Just shows how critical an eye they have, I suppose. Relatedly, Photoshopping a pink thing into a blue one and claiming it's a new, obscure version of the thing with strange qualities reminds me intensely of the "moon melon" hoax from a few years ago, where some prankster used Photoshop to turn a stock photo of a pink watermelon slice blue and said it was a "moon melon" which changes how other foods taste. Just a funny sort of symmetry there, pink to blue. Captured? Why do people have to do that. �� It's so cruel that people capture or kill a new species all for science. It's cruel. The blue flamingo looks gorgeous. And should be free in the wild. Same with the other unique flamingos. you guys... seriously? SERIOUSLY? LOL this is obviously Photoshop. Not one of the main 6 species of flamingo is blue. What a spoof. Thanks for the humor. People will believe anything.